“Sober Girls Designated Drivers Vancouver BC” are not just your very “own driver” we are also dedicated to supporting the communities we service. In support of the communities we service we offer charity rates for those who are so kindly giving to local charities because we believe those so kind deserve their very “own driver” for less cost to get home in their vehicle. There are a lot of great organizations in British Columbia Canada and we regularly give them vouchers for free designated rides to give away as a prize at their events. 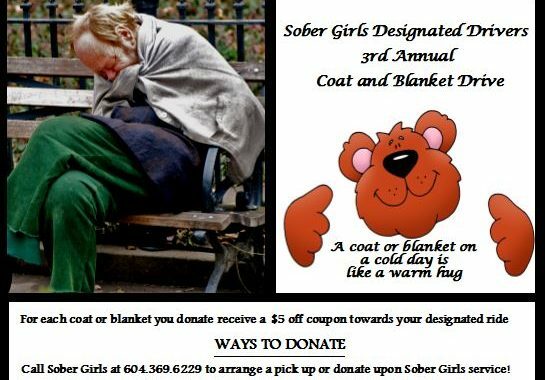 This year marks “Sober Girls Designated Drivers Vancouver BC” third annual coat and blanket drive. Last year we drummed up over three hundred coats from our “own drivers” , local businesses in our industry and locals in the community. The coats are washed and separated into groups and distributed by licensed charitable organization across the lower mainland equally. This means if one city has a low coat and blanket donation count that we break them up so that every city gets the same amount. The service industry is a big family; the owners and management in our industry along with our “drivers” and community patrons want to share the love because a coat or blanket on a cold day is like a warm hug. We have boxes located all over the lower mainland but if you suffer from any kind of mobility issues or for some reason you cannot get your donation to a drop location we will gladly come pick it up all you have to do is call us directly. It’s nice to be able to call your “own driver” on the fly however “Sober Girls Designated Drivers Vancouver BC” does require anyone who wishes to use our “safe ride” service to plan ahead to be responsible at our website. We are more than a taxi, more than a ride share; we are a lifeline service and a supporting member of the communities we service. All our very “own” and those who support community spirit have been more than supportive to our cause and their actions have proven so we have already received sixty four items to keep the less fortunate warm this year already. Keep in mind “Sober Girls Designated Drivers Vancouver BC” coat and blanket drive goes until February 15th and our goal is to double the donation count of three hundred coats and blankets from last year for a total goal of six hundred. This will be six hundred (round off) people across the lower mainland who will be able to stay warm this winter season. Let’s get together as a community and show those less fortunate that as a community together we care. “Sober Girls Designated Drivers Vancouver BC” coat and blanket drive we are not just your “own driver” but your “friends” and community supporter.